They call it the Tar Heel Circle. 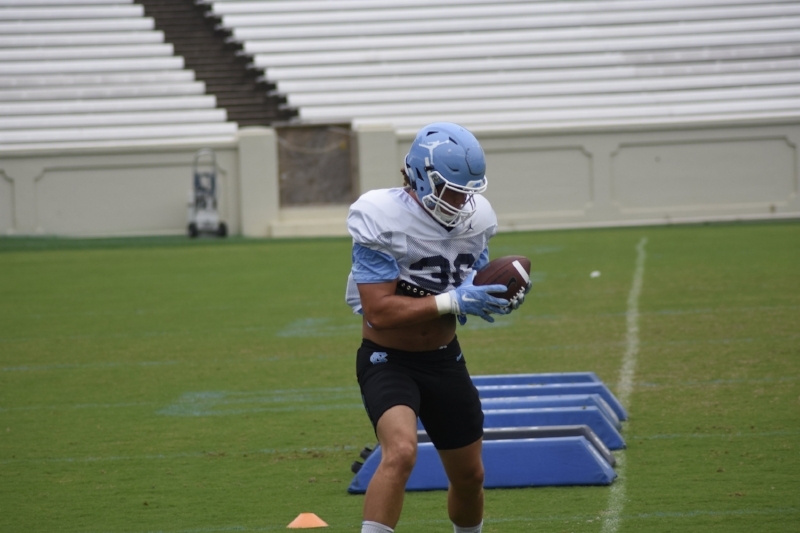 After Monday's football practice, they gathered in two circles on the field at Kenan Stadium: the offense on the west half, the defense and special teams on the east. The student-athletes jogged in place, facing their respective coordinators in the middle of the circle. One by one, alphabetically, their coaches called their names. "Cayson Collins!" on the east end. "Carl Tucker!" on the west. And they sprinted to the center. A brief, hushed conversation with the coach, then a pronouncement from the player. "My name is Carl Tucker, and I let the team down two times." And for every time the player let the team down, his entire side of the ball dropped to the ground, pushed themselves to their feet and leapt into the air. An up-down for every let-down. 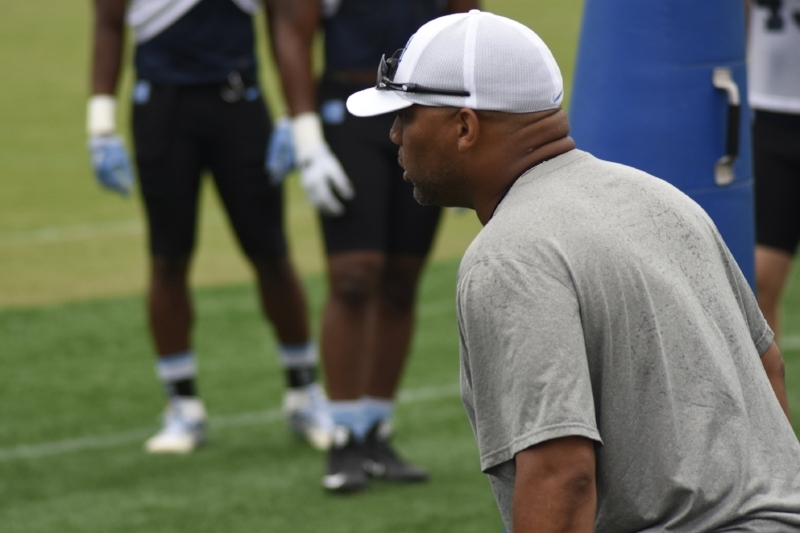 As the Tar Heel coaching staff graded the film from this past weekend's scrimmage, the Tar Heels' second of the fall, they identifed those let-downs, or 'loafs.' "If you're not going hard enough, if you're jogging to the ball, anything like that is a loaf," Tucker said later. "Anything that they've done, they just all it a loaf." There were a good number of up-downs in each circle this Monday morning, but not as many as the one prior. 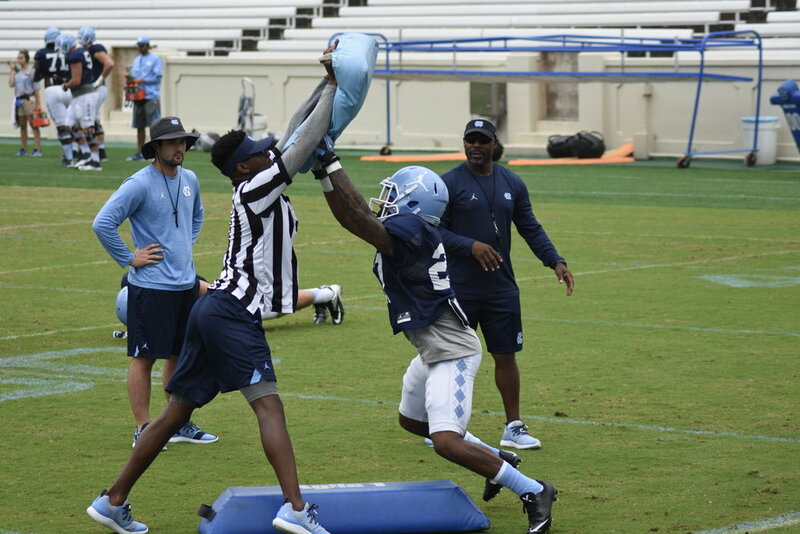 "Usually after the first scrimmage it's the highest (number) because everybody's just trying their hardest but they're not in 'game mode,'" Tucker said. "After the first scrimmade and the first Tar Heel circle, it definitely goes down, and everybody knows what they need to do. Everybody knows how they're expected to play." 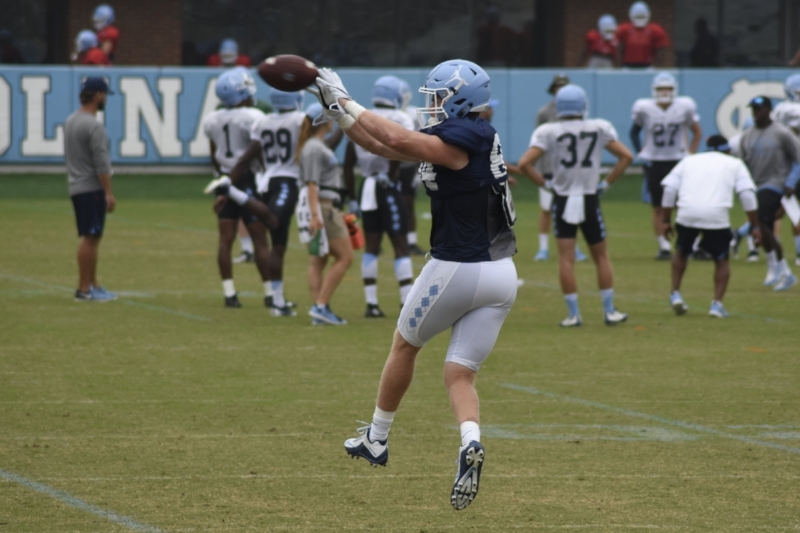 So yes, one would expect the loafs to go down from week to week as the Tar Heels on both sides of the ball become more comfortable in the game plan. "They should, and they did," offensive coordinator Chris Kapilovic said. "One to two, I think we went down five, so that was an improvement. And we had more reps (in the scrimmage). That's what you hope for. 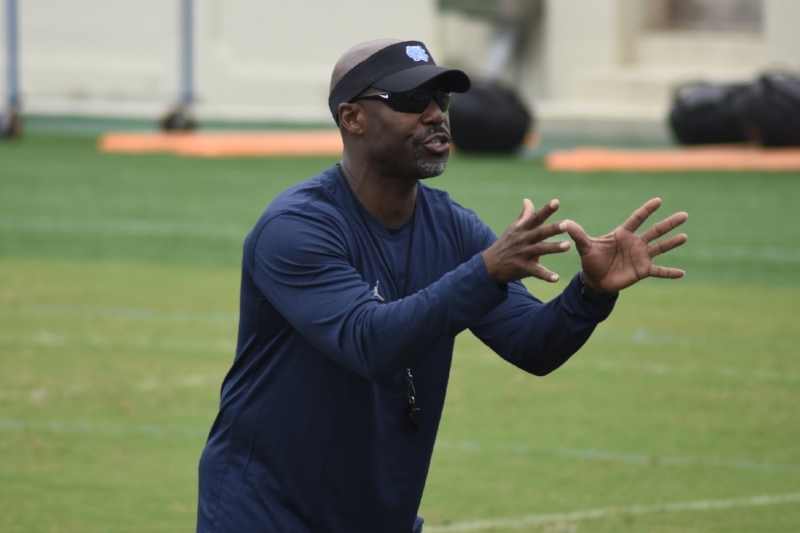 I'll say this about the guys: the number for the first scrimmage was the lowest since I've been here for a first scrimmage, so I think we have a bunch of guys that really want to play hard and work hard." 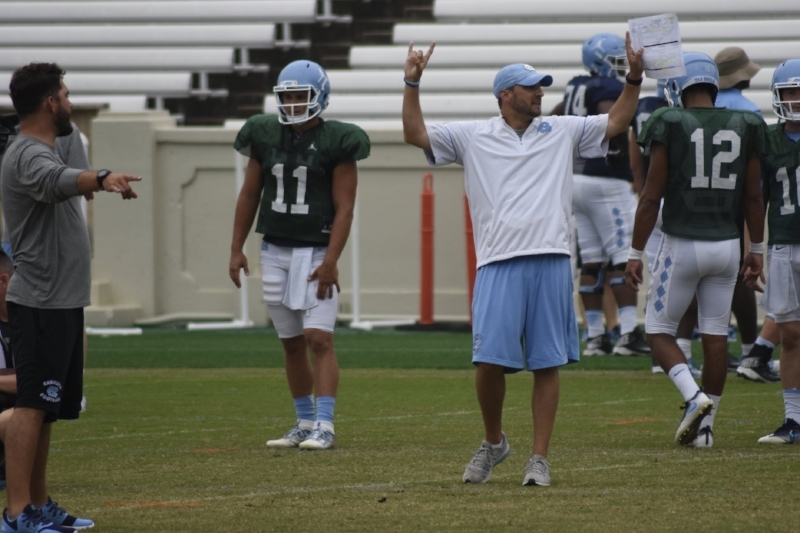 Beyond cutting down on the loafs, Larry Fedora said that there was a lot of improvement from one scrimmage to the next. "We got a lot of the mistakes that were made in the first game (cleaned up), and a lot of the guys that were thinking and not playing fast, there was a lot more energy, because the guys didn't have to think," the head coach said. "They knew what they were doing and were able to play and so there were not nearly as many mistakes as there were in the first one." Also . 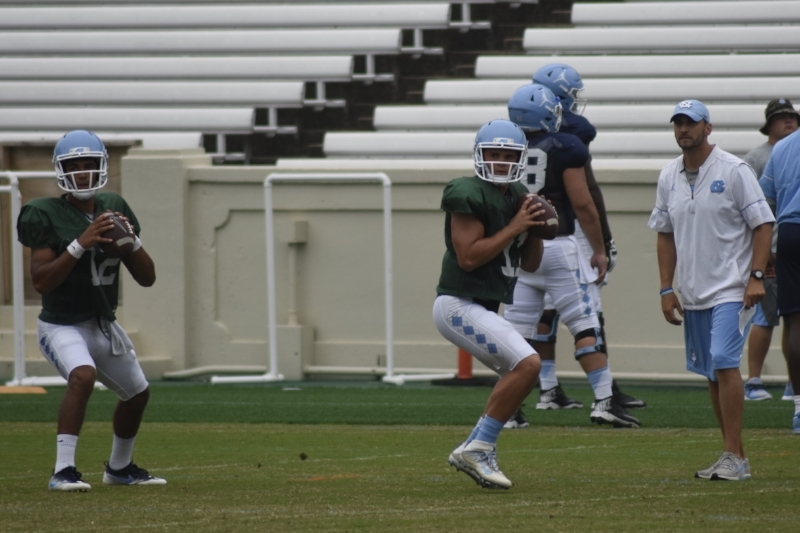 . . at least publicly, Fedora is not tipping his cap if there is any separation between the four quarterbacks vying for the starting position. "We've got four guys still competing; nobody's separated themselves and we've still got to get a lot better at the position to be successful," he said.